YouTube/Randy ColpekCostco shopper Randy Colpek crashes through a wall of beer. A commercial created by an avid Costco beer drinker has gone viral. The video is a series of outtakes that show Randy Colpek breaking through a wall of Costco’sKirkland Light beer while shouting out a series of slogans. Costco’s Kirkland private-label brand makes up a quarter of its annual sales. 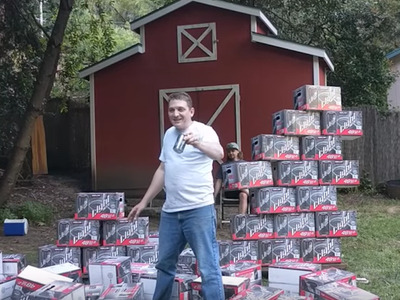 This man loves Costco beer so much that he’s made his own commercial of it. The video was posted on YouTube a year ago but has since gone viral after he posted it to Reddit on Wednesday. Costco did not immediately respond to Business Insider’s request for comment, but on Reddit, Colpek says that the retailer has expressed no interest in the ad. According to Esquire, a crate of 48 of these beers costs $US22. Costco’s low-cost private-label Kirkland brand has become a massive hit for the company since launching in 1995. These goods now make up about 20% of the products offered in the warehouse store. You can find Kirkland products in any category from groceries to household products and clothing. About a quarter of Costco’s $US118.7 billion in annual sales come from Kirkland products, and this number is growing, according to company executives who were cited by The Wall Street Journal.